I won’t lie. I was nervous about the BB cream and then the CC cream craze because I was afraid they were going to feel “mask-like”. I expected the BB and CC creams to be thick and clog my pores and some that I tried, did. But at last, after spending hours in Sephora, I found what seemed to be everything I was looking for! 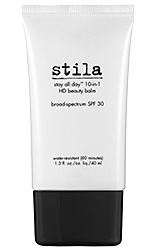 The first product I bought was the BB cream by Stila called Stay All Day 10-in-1 HD Beauty Balm. It retails for $38 and is worth it! It hydrates without being too oily, has SPF 30, hides my fine lines and doesn’t have any parabens or sulfates. It does have lasting power, but I wouldn’t say all day unless you are not being active. I wear it alone or with a little setting powder on top. It sets more with a powdery finish as opposed to a foundation look. The only con is that it only comes in one shade which is perfect for all seasons for me except for summer. Once I got a tan, it was too light for me. 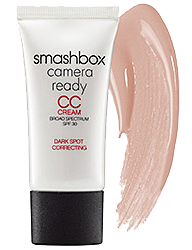 Since the Stila BB cream was a bit light, I went on the hunt for a summer one and this is how I came across my new love, Smashbox Camera Ready CC Cream SPF 30 Dark Spot Corrector. First off, it comes in a variety of colors to match all skin tones which is fantastic. The color I bought was Light/Medium. It is literally a moisturizer, primer, foundation, sunscreen, skin-perfector and dark spot corrector all in one! At first, when I got it home, I spread it all over my face and blended it out a bit with a foundation brush (you can also use a foundation sponge, like the Beauty Blender) and it was really dewy. I was so afraid I made a bad choice and for $42, I was extra upset. Then, literally in less than a minute, it dried and WOW! My fine lines were a lot less noticeable as were my pores. I had a nice matte finish, but not cakey, and I was almost glowing. It was amazing! I wore it outside in warm weather and it stayed put for hours and even helped control my shine. Yep, I am in love! I can’t wait to see if it helps with my dark spots! One side note: I know a lot of people complain that the BB and CC creams do not blend as well as foundation and this is true. You need a Beauty Blender sponge or a foundation brush to help blend it out. On the other hand, unlike a foundation, these creams offer many benefits…my favorite being SPF 30! Remember, the sun is the main cause of fine lines, dark spots and all those other awful things so SPF up and save your skin!